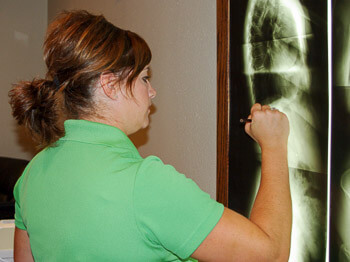 New Patients at Heartland Family Chiropractic, P.C. Welcome to Heartland Family Chiropractic, P.C. From the moment you walk into our warm and inviting practice, we hope you and your family feel at home in our care. To make your children feel comfortable and relaxed, we have an in-office play area complete with a chalkboard wall for them to draw on. On your first visit to see Dr. Chelsa, you’ll begin by filling out your new patient paperwork if you haven’t already done so. Then, you’ll have a consultation with Dr. Chelsa to discuss exactly what’s brought you in, go over your health history, and then perform a few exams that allow us to get a better look at how your nervous system is functioning in addition to a postural assessment and full spine x-rays. We’re big on patient education, and we always encourage you to ask any questions that you may have. Dr. Chelsa is happy to address your every concern! At your second visit, we’ll go over a complete report of findings with you and pinpoint what and where your issues are occurring. We’ll let you know exactly what type of care plan can help you, and we’ll tailor-make each visit to your needs. Before you leave, we’ll get you scheduled for your next few appointments. When it comes to chiropractic care with us, we’ll always continue to monitor your progress to ensure that you’re improving. Every 12th visit with us, we’ll redo your scans and show you what’s getting better. If we need to, we can make any adjustments to your care plan. At our practice, Dr. Chelsa will never force patients to continue with ongoing care unless they want to. Most patients find that they feel so great, they wish to keep visiting us for maintenance and to make sure their body stays in balance. The decision is completely up to you! We’d love to help you understand what natural chiropractic care can do for your health. Contact us today to get started by booking your first appointment. You’ll be glad you did!